Free download latest version of Battery Limiter for PC. If you have problems of rapidly loosing power on your laptop battery this might just happen because you are overcharging it. This might be true for even the most expensive laptops out there. Sometimes your battery might be under a lot of stress running towards the last percentages of its full capacity while charging. 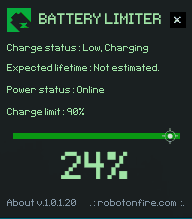 Battery limiter is a simple, small software that will help you and alarm you when charge capacity hits the limit. So you’ll never forget to unplug your laptop again. The default limit set is 90% but you can modify this up to 96% max. Once the alarm starts all you have to do is unplug your laptop to stop it. Battery limiter will keep the your laptop away from sleep mode while running so you don’t miss the alarm.